Note: I got a massive batch of 15 tapes from Peasant Magik. I debated on either giving a few of them the regular full blown review treatment or doing the burst shot quick & dirty reviews to get through as many as possible. I chose the latter. So this is one in a slew of short portraits of some of the newest Peasant Magik releases. As soon as this tape starts up, you’re lost in the fuzz. ROCKIN fuzz. It’s full of high-energy bite-sized punkgaze with obscured boy/girl vocals and even more obscured pop riffs. There’s epic melodies and a slight cosmic feeling that sounds a lot like if Hum made a shoegaze record. I’m sure if Hum did that it would be 100 times better than everything else in the world (including Pet Milk) but this is still a cool enough imagination primer. 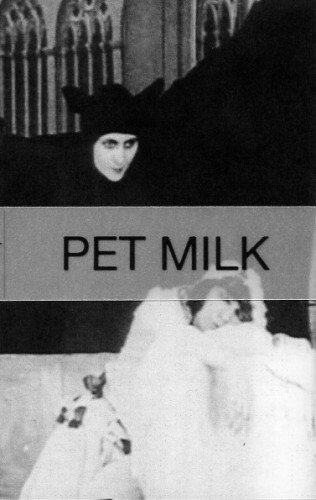 Either way though, Pet Milk is definitely going for that old school C86 vibe in a truly awesome way. Also, they cover MBV’s “Paint A Rainbow” and they do a pretty decent job.